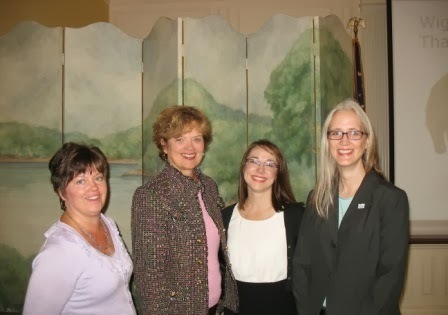 Late last week, the Conservation Center for Art and Historic Artifacts (CCAHA) kicked off its “Pennsylvania’s Top 10 Endangered Artifacts” campaign at the Governor’s Residence, with help from First Lady (and PHMC Commissioner) Susan Corbett. The project is supported by The Pew Center for Arts & Heritage. 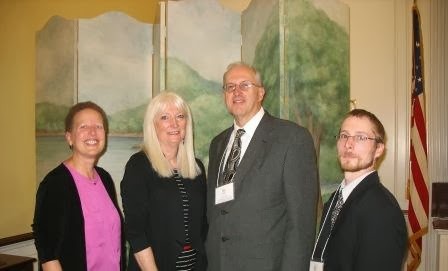 Staff from PHMC’s Harrisburg offices, Old Economy Village, and the Anthracite Heritage Museum were on hand to mark the occasion along with staff from eight other institutions. This project, part of a larger initiative called “Save Pennsylvania’s Past,” is aimed at drawing attention to the millions of artifacts (including objects, archival materials, and books) in the care of Pennsylvania’s museums, libraries, and archives. An independent panel selected 10 entries that represent the variety of holdings and that are in critical need of conservation. Among them are a coat and cap made for Harmony Society leader George Rapp and preserved at Old Economy Village and a coal sculpture of Abraham Lincoln by artist C. Edgar Patience in the collection at the Anthracite Heritage Museum. PA’s Top 10 list has already garnered publicity in traditional (for example, here and here) and social media—help us keep up the buzz. Please go to the project website here (or click on the links for the objects listed above). You’ll have a choice to vote for an object, donate to help preserve an object, or share the object on Facebook and/or Twitter. Or you can do all of those things. It’s just that easy. And you’re not limited to just one vote/donation/share, so make it a habit. The PA Top 10 are awarded points for all of these activities—the end result will be support for their conservation and stabilization. Voting closes on November 1, so please don't wait to get started. Brandywine Battlefield – Revolutionary War Encampment event, includes craft demonstrations, reenactors, and house tours (here for info). Admission charged. 10 am-3 pm. Sunday afternoon interpretive programming at Hope Lodge Historic Site, Landis Valley Village and Farm Museum, and Pennsbury Manor. Today marks the beginning of the Eckley Miners’ Village 2013 fall foliage photo contest. 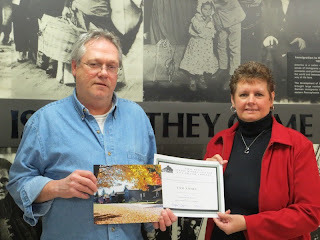 The contest runs through October 31, with entries due by November 8. Go here for more details. New videos: See the promo video for this year’s Bonfire at the Iron Furnaces event at Scranton Iron Furnaces (Oct. 19) here. The Railroad Museum of Pennsylvania has posted video of the ongoing restoration of the “Lindbergh Engine” (460) here on their Facebook page. I leave you with a bit of whimsy from a website devoted mostly to insider humor for historic site and history museum folks. The idea of combining Ask a Curator Day with Talk Like a Pirate Day struck me as funny and made me wish I had thought of it. Enjoy (or not). I hope you have a great weekend, mateys! Social media notes: You can see in-progress photos of construction at the Pennsylvania Lumber Museum on Facebook here. Check back often, as the building is coming into shape quickly. Wednesday, September 18, is #AskACurator day on Twitter @AskACurator. You can find a list of participating museums here. From the Parade of Sail, led by Niagara with Governor Corbett and the First Lady on board, to the fireworks, lighting of the Perry Monument, and the 1812 Overture, Tall Ships Erie 2013 (Sept. 5-8) was a rousing success. Thousands of people, including upwards of 5,000 school children on Friday, made their way to the bayfront to visit the ships, enjoy the water and sun, and learn a little history while they were at it. You’ll find a sampling of local coverage of the event here and here. On the 200th anniversary of the Battle of Lake Erie, Sept. 10, NPR ran a story recorded during the special reenactment held on Labor Day (you’ll hear the voices of captains Walter Rybka and Wes Heerssen). Congratulations to everyone involved with pulling off these commemoration events. If fiber arts are fun for you, check out Landis Valley Village and Farm Museum’s Wool Frolic tomorrow from 10 am to 4 pm. Details are here. While you’re there, be sure to visit this year’s exhibit, “I Thee Wed: Rural Pennsylvania Wedding Attire, 1830-1930.” I toured the exhibit last weekend with my mother and mother-in-law, and we all loved it. We learned a lot about the variety of clothing worn for weddings (from the types of dresses we’ve come to expect to “best” dresses that would be worn again). The exhibit cases in the center of the room allow for a 360° view of the dresses and suits, and stitch geeks can get an up-close look (please try not to press your noses against the glass). Case labels share brief biographical info about the wearers, along with copies of marriage licenses and wedding certificates. 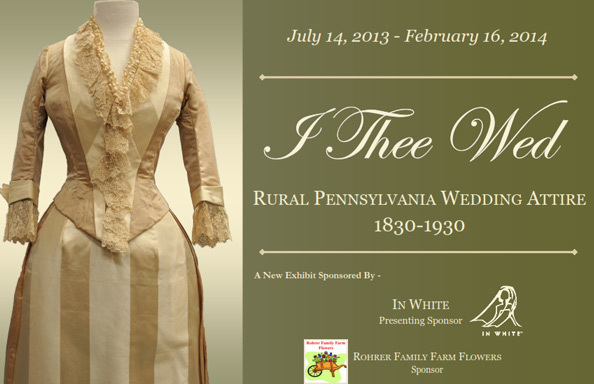 Additional exhibit cases and panels explore wedding portraits, wedding gifts, changes in fashion, accessories, and undergarments (egad, the corsets). A bobbin lace maker was set up in the exhibit space, and we enjoyed talking to her about her work. I realize that she’s not there all the time but thought it added a little something to our visit. The exhibit will be on view through Valentine’s Day, 2014. Elsewhere this weekend, Conrad Weiser Homestead is one of the stops on the Berks Heritage Council’s 2013 Hidden Heritage Tour (event runs next weekend as well). Also of interest: Bushy Run Battlefield’s Fall Lecture (Saturday, 1 pm), the Ethnic Music Festival at Eckley Miners’ Village (Sunday, starting at 1 pm), and Sunday afternoon interpretive programming at Daniel Boone Homestead, Landis Valley Village and Farm Museum, and Pennsbury Manor (times vary, so please check the individual websites for details). The National Endowment for the Humanities Blue Star Museum program for 2013 has ended, but free regular admission for active duty military members and their immediate families is offered year-round on the Trails of History. Click here for the list. For this year’s Drake Day (August 24), the annual celebration of the first successful well drilled for oil, Drake Well Museum presented an 1860s-style circus—complete with jugglers, acrobats, and fire-eaters—plus a photo booth, art activities by the Titusville Council on the Arts, a vintage band organ brought by Debence Antique Music World, food vendors, storyteller Bill Stumpf, and a petting zoo. By all accounts, a great time was had by all at this first-time (probably not last-time) event. A special admission fee encouraged local families to enjoy a day of entertainment and visit the museum’s regular exhibits as well. Thanks to Bruce Pratt, who shared the video below on Drake Well’s Facebook page. On the other side of the state, “William Penn” visited Penn Valley School to check out a new mural depicting Pennsbury Manor. 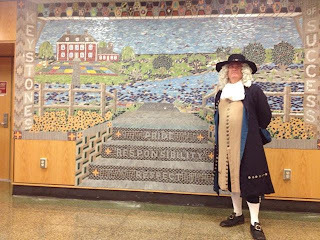 Also, in advance of Pennsbury’s 75th anniversary as a museum, summer interns conducted research on the site’s history and posted some of their findings on the blog here, here, and here. We’ve posted lots of info about the War of 1812 bicentennial on Trailheads. Flagship Niagara has spent much of the summer travelling to events around the Great Lakes. On Labor Day, the ship and crew were in Put-in-Bay, Ohio, for a reenactment of the Battle of Lake Erie featuring tall ships as well as quite a few other watercraft. Actor Billy Campbell portrayed Oliver Hazard Perry, transferring from US Brig Lawrence (played by the Windy) to US Brig Niagara (as herself). The Toledo Blade posted a gallery of photos from the event here. This weekend is Tall Ships Erie 2013, with 10 tall ships, entertainment, and more. Go here for details. Niagara will return to Put-in-Bay next week for a wreath-laying ceremony on Sept. 10, the actual anniversary of the Battle of Lake Erie. Other events this weekend on the Trails of History include Mountain Craft Days (today through Sunday) at Somerset Historical Center, Founder's Day (Saturday) at Ephrata Cloister, and Sunday interpretive programs at Conrad Weiser Homestead, Daniel Boone Homestead, Landis Valley Village and Farm Museum, and Pennsbury Manor.